This advanced carp fishing rig was designed so the point of the hook turns and catches hold extremely quickly. It is ideal when fishing for shy-feeding, cautious carp. This carp rig was devised and shown by Adam Penning on the latest Fox essential guide to carp rig DVD. Adam referred to it as the "advanced bottom bait rig", and he described it as having an aggressive hooking mechanism. He is certainly right with that statement, as you can see in the photos further below. Use any good coated braid to create this type of advanced rig system. Strip the coated braid so you end up with it long enough to have about 25mm down from the line-aligner to the weighted bead. Make sure you leave a long hair so that when a bait is on there is still 10-20mm of hair exposed. The small silicon tubing should be threaded onto the stripped section of braid before putting the hook on. You then thread the point of the hook through each piece of tube making sure not to catch the braid line inside. Then pull out more than required in order to tie the hair loop. Now with a bottom bait on, pull the braid back to judge the hair length. once this is done you can then tie a knotless knot. Now thread on the shrink tube, but don't shrink it yet. See below for further instructions. This fishing rig is supposed to work best when using a Fox SSC hook range. Two small pieces of silicon tubing, each of 2mm long, is used to hold the hair to the hook. The piece nearer to the point of the hook needs to be positioned so the hair leaves the hook in line with the point. 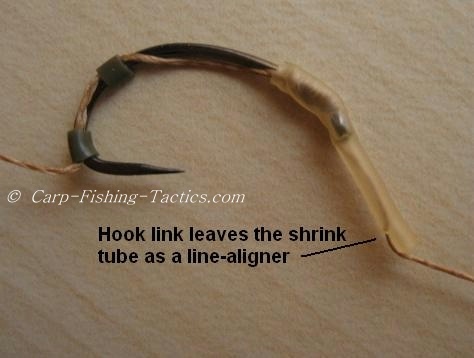 This means the weight of the bottom bait combined with the line-aligner (look at photo below) and the weighted shot helps pull the point down as the hook turns, resulting in a much faster penetration into the flesh. The combination of all 3 of these features gives this fishing rig an advanced hooking ability. Use a line-aligner system to increase the hook turn speed. I snip a small cut in the shrink tube, then use a gated needle to pull the braid through the hole so it leaves out the side of the tubing opposite the hook point. Now you can shrink it down while it is positioned by pulling on the coated braid end. After this you can then place a weighted bead up the line where the stripped braid ends. You can tie the coated end to a swivel by the lead set up. I prefer to tie a figure-of-eight loop and use a quick link for easy changing if I wish to try another advanced carp rig. 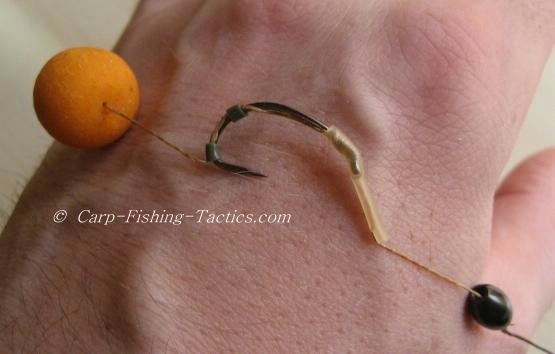 Just look at how quickly this advanced carp rig grabs a hold. I'd moved it about 3 or 4 millimetres before the point was digging into my skin! 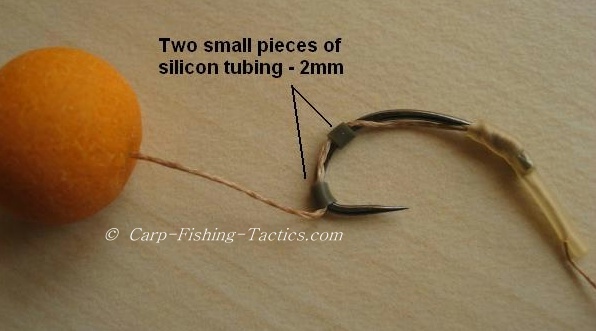 If you're getting lots of little bleeps while fishing for carp, then give this carp rig a try. You may be pleasantly surprised. Firstly, make sure the bleeps are not line bites! 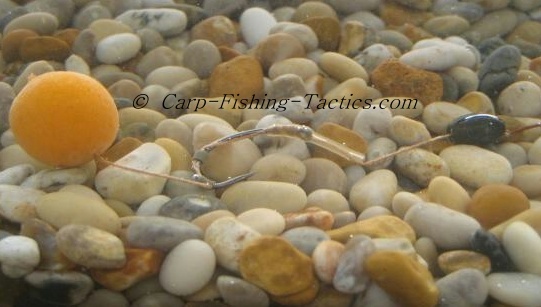 How the advanced bottom bait carp rig looks in water. 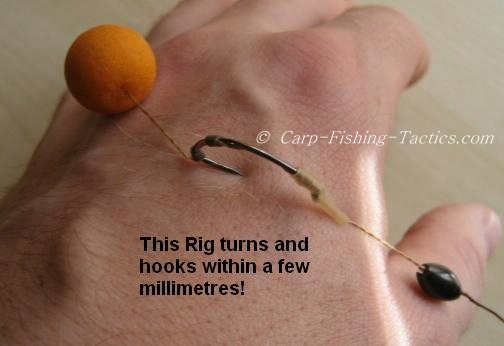 the extra weights used help pin the rig to the bottom and out of the way of any carp fins. If you don't want the shot to be visible you can colour it in with special marker pens to suit the bottom you're fishing on.